A virtual walkthrough of the new International Convention Centre (ICC) $1 billion precinct at Sydney’s Darling Harbour has been unveiled. Populous, the centre sits on part of a twenty-hectare site that will also include extensive public parklands and open space. Facilities of the centre include the Grand Ballroom, capable of accommodating 2,000 people in banquet mode and 3,500 cocktail mode, an external event deck featuring 5,000 square metres of city views, three plenary theatres seating 2,500, 1,000 and 800 people respectively and the ICC Sydney Theatre seating 8,000 people. The total exhibition capacity of the centre is 35,000 square metres, which includes a 2,400 square metre gallery. Hassell Design Leader on the project Ken Maher said the precinct would transform the city while retaining its character. "The re-making of Darling Harbour is a rare opportunity to design a significant new quarter within the central city. "It extends the urban fabric and re-connects the city to Ultimo and Pyrmont with more permeable networks of streets and lanes. Importantly it can bring a new level of public amenity for visitors and citizens alike through extended public parkland that is identifiably 'Sydney' in character,” he said. The new centre has a clear path to completion after last year’s demolition of the Sydney Convention and Exhibition Centres that occupied the site previously. 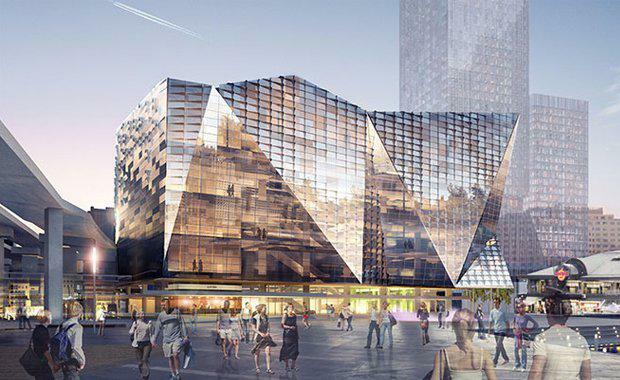 The design was awarded through an international design competition in 2012, won by the Destination Sydney Consortium that originally consisted of OMA and DCM partnering with Hassell and Populous. OMA eventually left the project leaving Hassell and Populous as the sole designers. The centre is due to be completed in December 2016.